To evaluate the efficacy of oral dissolution therapy (ODT), shock wave lithotripsy (SWL), and combined SWL and ODT for medium-sized radiolucent renal stone (RLS). 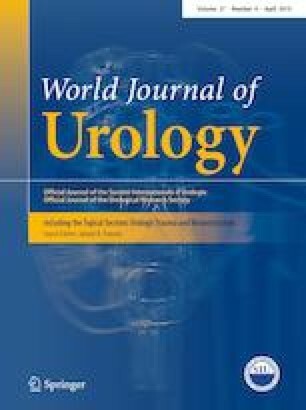 A randomized controlled trial for patients with medium-sized RLS, 1–2.5 cm, ≤ 500 Hounsfield unit (HU). The ODT patients were counseled for oral potassiumsodium-hydrogen citrate (Uralyt-U®). The 2nd group underwent SWL and the last group had combined SWL and ODT. The primary outcome, stone-free rate (SFR) at 3 months, was assessed by non-contrast computed tomography (NCCT). We defined complete response (success) if no residual fragment were detected by NCCT; partial response (failure) if there was a decrease in stone size, but presence of residual stones; no response if there was no change or increase in stone size (failure). 150 patients completed follow-up. The SFR at 1st month and 3rd month were, respectively; 16% and 50% in the ODT group, 10% and 46% in the SWL group, and 35% and 72% patients in combined group with (p = 0.03 and 0.003, respectively. The overall SFR for all groups was 66%. Combined treatment and initial response in first month follow-up were independent factors predicting SFR. In addition, combined treatment significantly decreased the overall stone volume (p = 0.03) and the need for additional stone management procedures after 3 months (p = 0.01). Combined ODT and SWL treatment constitutes the most rapid and effective therapeutic approach for medium-sized RLS, decreasing overall stone volume as well as the number of SWL sessions needed in comparison to SWL therapy, alone. Khaled Z. Sheir and Ahmed A. Shokeir are equal last author. Elbaset MA: Patients’ follow-up and data collection, Hashem A: manuscript writing and editing. Eraky A: study design revision, Badawy M: Radiology supervision, El-Assmy: study supervision, Sheir KZ: study supervision and statistical analysis, Shokeir AA: study supervision. All procedures in this study involving human participants were in accordance with the 1964 Helsinki Declaration and its later amendments.